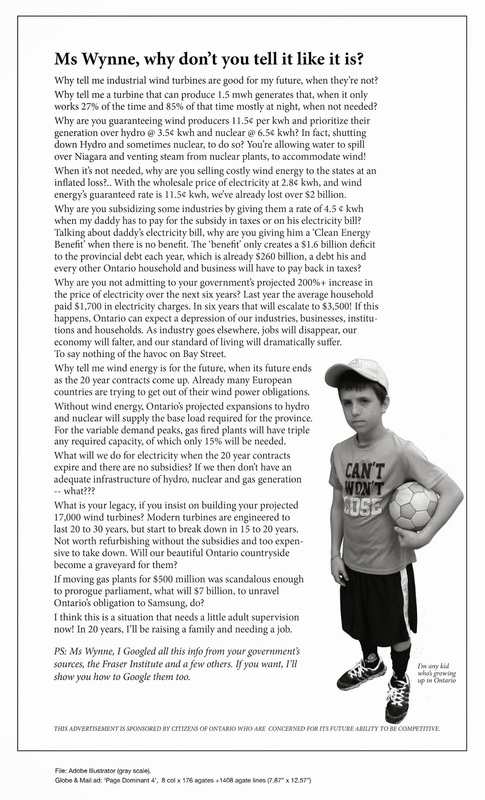 Ontarians taking it on the chin (& wallet) | Mothers Against Wind Turbines Inc.
TORONTO – Soaring power prices, wind farms imposed on places that don’t want them and now this: Ontario consumers being dinged by power companies for things such as raccoon traps, scuba gear and staff car washes. Zapped before by the province’s spending watchdog for its handling of the energy file, Ontario’s Liberal government — heading into an election year — took it on the chin again Wednesday in Auditor General Bonnie Lysyk’s annual report, which found ratepayers have footed the bill for up to $260 million in ineligible expenses under a provincial program that puts the producers on standby to generate power. She also found ratepayers are paying the cost for large industrial companies’ electricity savings, and that Ontario’s Independent Electricity System Operator (IESO) hasn’t implemented repeated recommendations from the Ontario Energy Board, including one that could save ratepayers $30 million a year. Lysyk’s latest report looked at a program that pays power generators for fuel, maintenance and operating costs when the IESO puts them on standby to supply energy. Nine generators claimed up to $260 million in ineligible costs between 2006 and 2015, Lysyk said. About two-thirds of that has been paid back. One natural gas plant in Brampton “gamed” the system for about $100 million, the energy board, the province’s regulator, has reported. Generators claimed thousands of dollars a year for staff car washes, carpet cleaning, road repairs, landscaping, scuba gear and raccoon traps, “which have nothing to do with running power equipment on standby,” Lysyk wrote. One company claimed about $175,000 for coveralls and parkas over two years, she said. “The program was such that bills could be submitted but without any support for the bills and the bills were being paid, and it wasn’t until more requests were made for detailed information that (the IESO) became aware that there were costs behind that bill that probably shouldn’t be reimbursed,” Lysyk said. Lysyk had previously skewered the Liberals over electricity, concluding customers paid $37 billion for the government’s decisions to ignore its own planning process for new power projects, and that a $2-billion smart meter program spent double its projected costs and didn’t ensure conservation goals were met. Her conclusions about the smart meter program led then-energy minister Bob Chiarelli to say the auditor’s numbers were less credible than his because the electricity system is complex and difficult to understand. Lysyk spent 10 years working at Manitoba Hydro. The program to pay costs when energy suppliers are put on standby began in 2003, when Ontario’s electricity grid had supply issues, but now the province has surplus power.